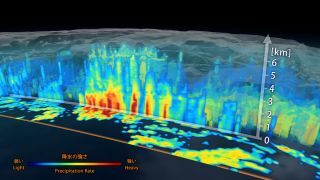 A 3D view inside an extra-tropical cyclone observed off the coast of Japan on March 10, 2014, captured by GPM's Dual-frequency Precipitation Radar. The vertical cross-section, approximately 4.4 miles (7 kilometers) high, shows rain rates, with red areas indicating heavy rainfall while yellow and blue indicate less intense rainfall. NASA and the Japan Aerospace Exploration Agency (JAXA) today released the first images from a new satellite that can image precipitation on Earth in 3D. Scientists gave the satellite a sort of shake-down cruise in early March by capturing precipitation inside a cyclone over the northwest Pacific Ocean (above). The satellite uses two different instruments that can detect subtle differences in precipitation — light rain for example, or a mix of falling snow and ice. NASA says the satellite is the first spacecraft designed to detect light rain and snowfall from space. VIDEO: Wanna Launch a Satellite? You Can! Onboard radar shows clouds in three dimensions, across the surface of Earth and upward into the atmosphere. The colors show the rain rate, or how much rain or snow is falling. Red indicates heavy rainfall —yellow and blue indicate less intense rainfall. An extra-tropical cyclone seen off the coast of Japan, March 10, 2014, by the GPM Microwave Imager. The colors show the rain rate: red areas indicate heavy rainfall, while yellow and blue indicate less intense rainfall. The upper left blue areas indicate falling snow. "I knew we had entered a new era in measuring precipitation from space, said project scientist Gail Skofronick-Jackson, at NASA's Goddard Spaceflight Center, in a release. "All this new information comes together to help us better understand how fresh water moves through Earth's system and contributes to things like floods and droughts."